Botanically, mosses are non-vascular plants in the land plant division Bryophyta. They require sufficient moisture, access to nutrients and harvest sunlight to create food by photosynthesis. There are approximately 14,500 species of mosses. 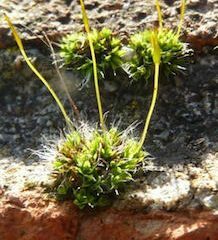 The most common species in urban Ireland are the greycushioned grimmia, Grimmia pulvinata; thickpoint grimmia, Schistidium crassipilum; and the wall screwmoss Tortula muralis. Although mosses do not cause direct damage to roof tiles, they increase water capillary creep causing in the fullness of time corrosion of the fixings and ageing of the overall structure. They can cause some lifting when growing in the vertical bond. As they absorb moisture, they also add weight to roofs and when they become heavy enough or dislodged by bird activity etc, they can fall in gutters and down pipes and cause blockages. On the ground the deleterious effects of mosses is slower to take effects, except on artificial grass, where they rapidly clog the drainage leading to runaway maintenance issues. It is recommended to clear moss before treatment. This is done by hand on roofs, or mechanical brushing on the ground, particularly on artificial grass. AlgoClear® Pro being de-activated in contact with biomass, it makes good sense to reduce it’s volume before applying the biocide. Moss are part of the Bryophytes and, unlike plants have no vascular tissue and reproduce by the production of spores. They are prolifically produced by fungi, moss and, in particular ferns. Most spores are distributed by wind. Typically, spores are released in early May, for a period of about one week. Prior to release, the spore sacks are ripening, but once the conditions are appropriate, they release the spores and thereafter the spore sacks are empty. Hence, the major period of concern for spread is limited the high sporulation period. Quaternary Ammonium Compounds (DDAC) are not effective at killing spores due to the spores having a thickened cell wall. However, as the spores begin to germinate, they produce protonema which are thread-like filaments which grow and colonise the substrate on which they have established. The protonema have thin cell walls and it is at this stage that the DDAC is able to penetrate protonema and disrupt the cells, killing the organism prior to it becoming established on surfaces. In addition to the effectiveness against moss, AlgoClear® Pro is an extremely effective algaecide and will be effective at reducing these species colonising most surfaces. A lichen consists of 2 or more partners that live together symbiotically, with both of them benefiting from the alliance. One partner is a fungus. The other is either an alga – 90% of known lichen – commonly Trebouxia, then Trentepohlia or a cyanobacterium – about 8%, commonly Nostoc. The alga or cyanobacterium is able to use sunlight to produce essential nutrients by photosynthesis that feed both partners. The fungus creates a body, called a thallus, in which they both live. The fungus also produces chemical compounds that may act as sunscreen to protect the photosynthetic partner. There are more than 1,700 species of lichen in the British Isles. Approximately 30,000 species of lichen have been described and identified worldwide. The algal partners in lichens can be found living on their own in nature, as free-living species in their own right. The fungal partners in British lichens are recognizable Ascomycetes or Basidiomycetes. However, they have come to need the right kind of algal partner in order to survive. Unlike other fungi or indeed their algal partner, they cannot survive on their own. Lichens have a variety of different growth forms. The simplest lichens are crusts of loosely mixed fungal hyphae and algae. Others are more complex, with leafy or shrubby forms like miniature trees, also having specialised structures to attach them to a surface.